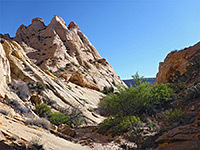 At least eight drainages on the east side of the Waterpocket Fold in Capitol Reef National Park have an official trailhead, reached by the mostly unpaved Notom-Bullfrog Road. 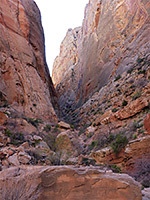 Ravines towards the north, such as Burro Wash, are long and not always easy to explore, but those further south are shorter, since the Fold is narrower; two relatively popular canyons in this area are Headquarters and Surprise, which are just half a mile apart, a short distance south of the junction of the road with the Burr Trail. 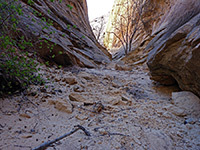 The main, or south fork of Surprise Canyon is the branch usually explored; a trail leads to the mouth and onto a short, level, narrows section, before, as is usually the case for canyons hereabouts, the drainage gains height steadily, at one point via a short, curving dryfall but mostly by a bouldery slope which may be climbed as far as desired, though the lower slot is the most photogenic part. 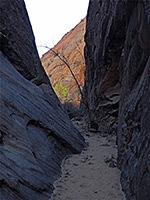 The adjacent middle and north forks are similar, and all can be seen on a loop hike of about 4 miles. 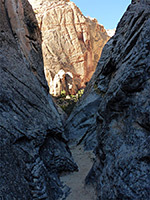 The rocks at the edge of the reef are colorful, a mix of white, red and orange, and are eroded into little peaks and ridges, and while the tall cliffs around the narrows are rather gloomy - grey or dull red, the hike offers an easy way to see three moderately interesting canyons in close proximity. The hike is served by a small, three-vehicle trailhead, along Notom-Bullfrog Road 34.3 miles south of Hwy 24. High verges restrict roadside parking hereabouts but it is rare for more than one group to be here at the same time. The trailhead can also be used for primitive camping. 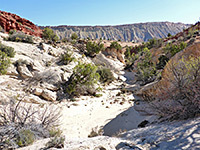 The path from the parking area crosses a dry, sandy wash and heads southwest over sagebrush flats, soon coming close to the edge of the reef, just before which is the slightly larger but still usually dry channel of Halls Creek. 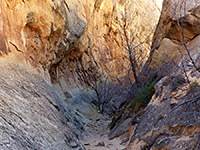 After here the trail crosses a third drainage, the Surprise Canyon exit channel, and continues through a brief patch of bushes and low, sandy hills, before descending back to the wash, here filled with clean, light-colored sand. 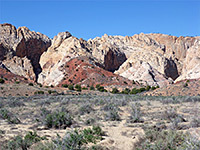 The wash leads through a short section of inclined, angular red rocks of the Carmel Formation, and into the much thicker layer of white Navajo sandstone. The northern slopes of the ravine are crossed by pretty, wavy bands of pink and orange. 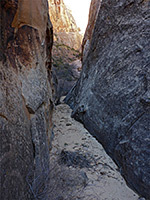 The canyon stays relatively wide but quickly becomes deep, up to an even wider part where a small tributary joins from the south, however just past here is a narrower, slot-like section, where the drainage starts to gain height. 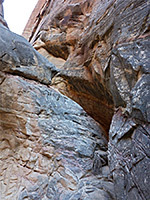 The most enclosed part ends quite soon and the canyon steepens, at one point partially blocked by a curving dryfall which has a cairned bypass route on the left side, though the falls can be climbed directly - easiest when descending. Above is a steep slope with many large boulders, leading eventually to a cliff-bound basin right at the top of the ravine, now 500 feet above the valley floor. The views up and down the canyon are very good, and the drainage contains a reasonable selection of wildflowers, mostly in the lower reaches. 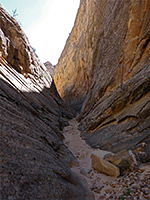 The shorter, middle fork of Surprise Canyon is reached by walking back down the south fork to the first major junction, on the north side, quite close to Halls Creek, then turning left (north), up the wide sandy streamway for a quarter of a mile, and bearing left again at the next intersection, along a lesser drainage. 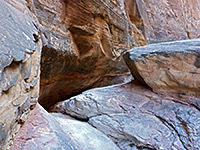 A short walk, up a little slope and along a wash leads to a section of narrows, which contains two minor upclimbs, followed by a wider part, and a second, short slot. After here is a wider passage with trees, followed by a more open slope, enclosed by high cliffs on three sides - similar to the south fork. Back at the second junction, a slightly longer walk up the northernmost branch of the drainage reaches a short slot, containing a few bushes and trees - the passages here are not quite as enclosed as the middle or south forks. Beyond the narrows, the floor stays level for a while but the passages are wider, with more undergrowth. 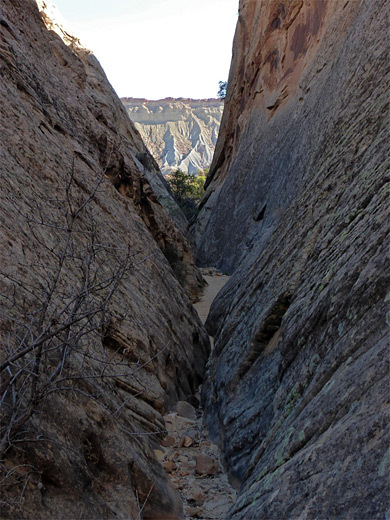 Like all canyons hereabouts, the streambed is usually dry, unless after recent rainfall.